Introducing the iOS 6 Feast! 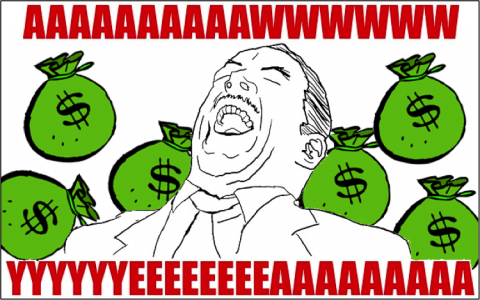 Today is a day to celebrate – the iOS 6 NDA has been lifted, so we can finally talk about the iOS 6 SDK! The iOS Tutorial Team and I believe that iOS 6 is one of the most exciting releases yet. There are some amazing new technologies that every developer should know about – and we’ve been working hard to prepare some amazing new tutorials for you, to help get everyone up to speed! And yes – just like last year, we had to do something special to mark the occasion. 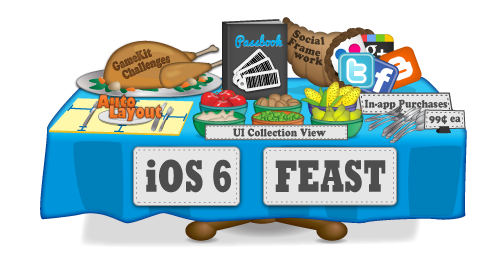 We are happy to introduce this year’s iOS 6 Feast! 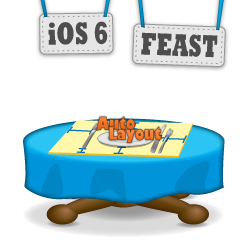 During the iOS 6 Feast, you’ll learn about all of the new APIs introduced in iOS 6 through easy-to-understand tutorials – Auto Layout, UICollectionView, Passbook, the Social Framework, In-App Purchase mods, and much more! Plus, we have some awesome giveaways for some lucky readers – our most epic giveaway yet! Want to find out more? Keep reading for more details! Auto Layout is one of the coolest new features of iOS 6, and is something every developer should know. It allows you to make much more flexible user interfaces without having to write a ton of code. Auto Layout is quite powerful when you get used to it, but can be tricky to learn at first. Of course, we can’t have that, so Matthijs Hollemans has put together a free tutorial to make learning how to use it much easier! This tutorial is currently scheduled to run later this month. But – what if you want it right now? All you have to do is retweet this post to help get the word out! If/when the post reaches 100 retweets, we will immediately post the Auto Layout tutorial to whet your appetite. Just click the button below! Remember that’s just the appetizer – keep reading for more! If you really want to learn iOS 6, a measly appetizer just isn’t enough. You want the full course – and you’ve got it with iOS 6 By Tutorials! Auto Layout: Learn how to make your views easier to localize and more adaptable to different sizes. UICollectionView: Learn how to easily display your data in a grid or your own custom layouts! Passbook: Learn how to create your own passes on your own server and modify them at runtime! In-App Purchases: Learn how to use the new Apple hosted downloads to create a completely dynamic store! Social Framework: Learn how to share data to social frameworks and access the Facebook API! And much more – 26 chapters and an epic 1,500+ pages. The length of 2-3 books for the price of 1! You’ll learn the topics easily. We learned things the hard way and scoured tons of often sparse documentation so you don’t have to. Learn with hands-on practice, by going through easy to understand tutorials with practical sample code. You’ll learn the topics deeply. We split up the topics so each author could focus on 1-2 topics in great detail. That way each of us could dive deep into our topics, far beyond the surface. In the end, you’ll know the topics from top to bottom and you’ll be ready to use them in your own apps! You’ll have fun along the way! We work hard to make our tutorials interesting, educational, and fun. We spent a lot of time polishing each tutorial to reach the high-quality tutorial standards this site is known for – and then some! The result is a book you simply can’t get anywhere else! 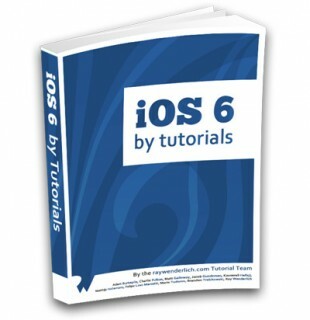 iOS 6 By Tutorials has the highest quality tutorials on the Internet, written by the developers who know tutorials. There’s no better way to learn iOS 6! And the best part is – the book is 100% complete! We worked like crazy ever since WWDC so we’d have it to you as soon as the NDA lifted. So you can get the book right now! 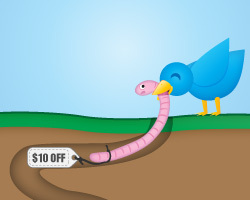 And to thank our regular readers, you’ll get an early bird discount! The book will usually sell for $54, but for a limited time we will sell it for $44. So what are you waiting for – pick up the book and update your skills to iOS 6 today! Don’t worry – we haven’t given up on iOS 5 by Tutorials! In fact, the two books are meant to be complementary to each other – each book will focus on the APIs introduced in that version of the OS. In fact, we hope to update iOS 5 by Tutorials to iOS 6 (ironically enough) sometime soon – we just haven’t had a chance yet because we’ve been so busy getting iOS 6 by Tutorials ready. However, when we do update the book to iOS 6 – it will be a free update to everyone who bought the PDF on this site! Lowered price. Now that iOS 6 is out, we are reducing the price for iOS 5 by Tutorials to $44 ($10 off). A book bundle! We are pleased to announce a special bundle where you can get both books at a reduced price – just $77! The books would usually sell for $98 ($54 + $44), so this represents over $20 in savings! 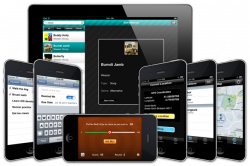 So if you haven’t picked up iOS 5 by Tutorials yet, we recommend you get the bundle – you’ll get the best of both worlds! If you’re a customer of the iOS Apprentice Series, we have good news for you – the series is now fully updated for iOS 6! The iOS Apprentice is the best way for complete beginners to learn iOS development. It guides you through creating four complete apps from scratch – via epic-length tutorials! Wondering how to get access to the latest version? As always, you can find the latest links in the iOS Apprentice private forums. If you do not already have access to these forums, you can sign up here. 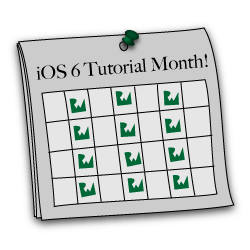 In fact, every Monday, Wednesday, and Friday in the next calendar month, we will post a free new iOS 6 tutorial! 5 abbreviated chapters from iOS 6 by Tutorials. We will be posting 5 chapters from iOS 6 by Tutorials for free on the site so you can see what it’s like. However, the chapters in iOS 6 by Tutorials are long! To keep the posts at a reasonable length, we will be shortening each chapter to just the essential elements in a 2-part series. Don’t worry – it will still be plenty to get you started! 5 older tutorials updated to iOS 6. As you know, this site has a lot of tutorials. One of our goals is to keep them up-to-date as much as we practically can, so we are going to update 5 of the older tutorials to iOS 6 based on what we learned while writing our chapters! So check back here every Monday, Wednesday, and Friday (and then just keep on reading!) for some amazing free iOS 6 tutorials! To wrap up the iOS 6 Feast, we are going to have a sweet giveaway. The iOS Apprentice Series ($54 value): Learn how to make iPhone and iPad apps via epic length tutorials – for complete beginners! 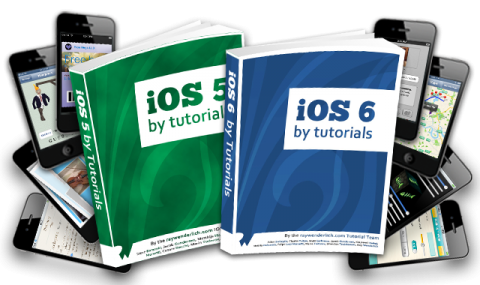 iOS 6 By Tutorials ($54 value): Learn about the new APIs that were introduced in iOS 6 like Auto Layout, Collection Views, and Passbook – over 1,500 pages of high quality content! iOS 5 By Tutorials ($44 value): Learn about the new APIs that were introduced in iOS 5 like ARC, Storyboards, and Core Image. Still relevant in iOS 6! Learning Cocos2D Print Version ($45 value): Learn how to make games with the most popular 2D game framework in iOS! Cocos2D video training ($99 value): Prefer to learn Cocos2D via videos instead? Check out this video training course! Space Game Starter Kit ($77 value): Learn how to make a full side-scrolling space game with Cocos2D! Update 9/20/12: New prize added! iOS for .NET Devs ($39 value): Are you a .NET developer that wants to transition to iOS? This book is for you!! Update 9/20/12: New prize added! CocoaConf 2013 Ticket ($699 value): Attend one of the best iOS developer conferences in the world, with multi-session tracks, hands-on labs, and more! Coming to 8 US cities in 2013 – choose the best match for you!! AppViz 2 ($49 value): The best tool for monitoring your iOS and Mac App Store sales. Stencyl Studio 1 Year License ($199 value): Quickly create iOS and Flash games – without code! Glyph Designer ($30 value): Design beautiful fonts for your iOS games! Particle Designer ($8 value): Create amazing particle systems for your games with a visual editor! SpriteHelper ($25 value): An easy to use sprite packer, with physics shape tracing support! LevelHelper ($50 value): Design levels for your game with a visual editor! CoronaComplete Pro ($25 value): A professional code editor for Conona games! Shaderific ($3 value): Get started with OpenGL ES 2.0 shader development on your iPad, iPhone or iPod touch today! Update 9/20/12: New prize added! Corona SVG Level Builder ($99 value): Create Corona SDK physics based games, levels and maps by just drawing in Inkscape. Plus a full Corona SDK game source code! Added 10/25/12: Texture Packer ($29 value): The sprite sheet creator that turns chaos into order! Added 10/25/12: PhysicsEditor ($19 value): Edit your physics shapes with ease! Update 9/20/12: New prize added! ShinobiCharts ($499 value): Add high quality charts to your iOS apps in seconds! Update 9/20/12: New prize added! PDFTouch SDK ($249 value): A fast and customizable framework for rendering PDF files in iOS apps! Update 9/20/12: New prize added! RadioTunes SDK ($149 value): A radio streaming SDK for iOS with support for many codecs and protocols! Tap for Tap 100,000 free ad impressions ($100 value): Drive traffic to your apps through the premiere mobile ad exchange network! raywenderlich.com sidebar ad for 1 month ($125 value): Drive some eyeballs to your apps or projects – a great way to reach some of the most talented iOS developers around! Touch Code Magazine banner ad for 1 month ($50 value): Want even more eyeballs? Try another ad on Marin’s site! Bonus loot: Just to make this dessert even sweeter! 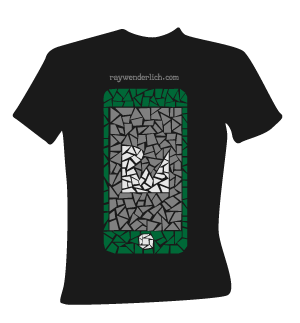 raywenderlich.com T-shirt ($25 value): Sport a stylish black t-shirt with a colorful mosaic iPhone design! In total, the grand prize has more than $3,000 in value! Huge thanks to all of our sponsors and friends who helped make this massive giveaway possible. Please consider checking out their pages to thank them for their kindness! We want to give you more than one chance to win though. So in addition to the grand prize winners, we’ll be giving out a bunch of bonus prizes to random retweeters! 2 people will win a single item of their choice from the above list (except for the new items added since launch, or cash for the iPhone 5, that’s for the grand prize only)! 4 people will win a copy of AppViz 2 – the best tool for monitoring your iOS and Mac App Store sales. 8 people will win a raywenderlich.com t-shirt, magnet, and geeky bumper sticker! 16 people will win 50,000 free ad impressions from Tap for Tap – the premiere mobile ad exchange network. To be eligible for this epic giveaway, all you have to do is send one or more tweets during the iOS 6 Feast with the #ios6feast hashtag. You can reweet posts with this hashtag (including this one!) or just send general comments. It’s OK to submit as many tweets as you like (as long as you aren’t spamming of course!) We will choose random winners from all of the tweets marked with the #ios6feast hashtag, and they’ll get all the epic loot! Want to make your first entry? Just tweet this post with the #ios6feast hashtag by clicking the button below! Want an iOS 6 Tutorial Right Now? Retweet this post – if it reaches 100 tweets we’ll post the first tutorial right away! Want to get quickly up-to-speed with the new iOS 6 APIs? Check out our new book iOS 6 By Tutorials! Don’t have iOS 5 By Tutorials Yet? Save money with the iOS 5 and iOS 6 By Tutorials Bundle! An iOS Apprentice Customer? Download the latest version of the iOS Apprentice, fully updated for iOS 6! Want tons of free tutorials? Come back here every Monday, Wednesday, and Friday for the next month for a new post on iOS 6! Want to get mad loot? Send one or more tweets during the next month with the #ios6feast hashtag! The iOS Tutorial Team and I hope you enjoy this feast, and that you’re fat and happy by the end! Stay tuned for a bunch of great iOS 6 tutorials, and if you have any questions or comments about the iOS 6 Feast, please join the forum discussion below!